Mr. Markiewicz was the artistic director and conductor of the Raritan Valley Symphonic Band from 2005-2013. In January 2012 he was appointed Music Director of the critically acclaimed Imperial Brass and since 2011 has been the artistic director and conductor of the Somerset Valley Orchestra. As a conductor/educator Mr. Markiewicz strives to share his enthusiastic vision for growth and increased musicality. Throughout his career every organization he has come in contact with has experienced unprecedented prosperity and success. In particular the S.V.O. has been transformed from an ensemble that performed arrangments/pop literature to a full symphony orchestra that now plays staples of the orchestral repertory. For the past 20 years he has been a NJ Public School Educator. He is also an adjunct music education professor at Montclair State University. 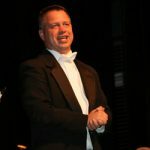 Since the mid-1990’s Mr. Markiewicz has been in demand as a guest conductor/clinician and brass pedagogy specialist across the United States, Japan and England. In 1998 he was appointed to be the first American and only Honorary member of the British Youth Band Association. In 1996 he led the brass ensemble that performed the famous John Williams Fanfares for the closing ceremonies of the Olympics held in Atlanta, Georgia. In 2011 Mr. Markiewicz retired from a twenty- five year career leading some of the best drum and bugle corps brass sections in the history of DCI. Mr. Markiewicz is most proud of the twelve years he spent instructing the reining world champion “Cadets” (Previously Garfield Cadets). Always active in education, Mr. Markiewicz is a founding board member of the NJ Band Association, and is excited to be one of the co-chairs of the Inaugural NJMEA Wind Band Academy.